As regular Adirondack Lifestyle blog readers know, my family and I are currently building a timber frame home. Although I have dropped the ball a bit on my promise to post regular progress updates, I am pleased to report progress continues. Framing has begun on the second level and I am finally getting the hang of translating paper plans into a home. This, of course, because the structure now stands before my eyes, with the sun illuminating and breezes flowing through the floor plan. But that is a story for another day and only applies to this Father's Day greeting to say I wish I had inherited my father's knack for abstract thinking. 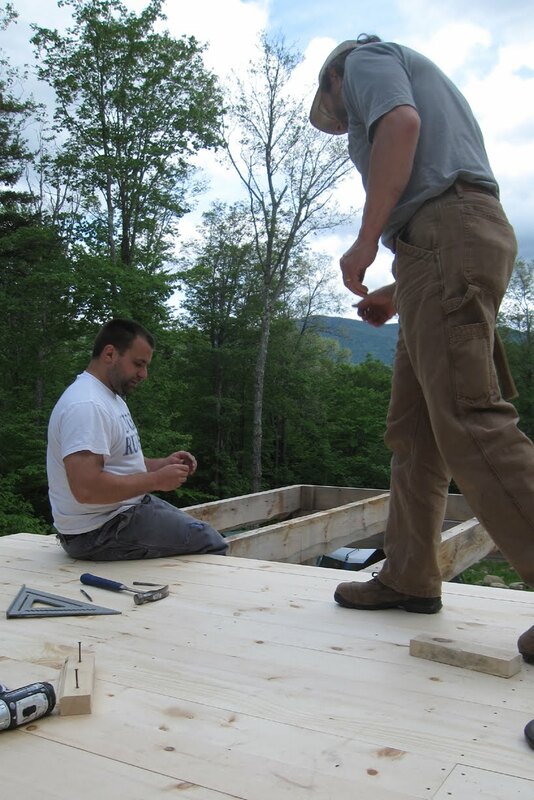 Our Adirondack building project and Father's Day provide the perfect opportunity for me to introduce the timber frame building team of Reed2. As you can see in the above featured photo, training for the youngest member of the Reed2 team, my son Eddie, started many years ago under the patient tutelage of his father, Ed. When Eddie was growing up, the boys always had a project going. Whether it was building a cage for a pet rat or a screened porch, they enjoyed doing it together. Years later, as you can see in the photo below, they are still having fun working together on yet another project; our new home.